Within 90 minutes of Reno, Nev. in the High Sierras, visiting golfers can get a taste of a variety of different types of golf—valley, desert and mountain, designed by some of the game’s top architects—plus blow-you-away scenery. There may be too many for one visit, so breaking up and taking separate visits to Lake Tahoe, Truckee and Graeagle could be the better option. Arriving or departing via the Reno airport, the Red Hawk Golf & Resort, nestled in the foothills of the Pah Rah mountain range in nearby Sparks, Nev., should be considered as a golfing option. The Lakes Course, designed by Robert Trent Jones Jr. is aptly named with plenty of water hazards. All four par 3s feature shots over water. The Hills Course, designed by Hale Irwin, puts the emphasis on accuracy with small greens and deep bunkers filled with white crushed marble. A few lucky enough to possibly know a member at the private Montreaux, Reno’s most prestigious address, should accept an invitation. The Jack Nicklaus design, which hosts the Reno Tahoe Open each summer, offers breathtaking mountain views with water on 11 holes adding to your challenge. If tied after 18 holes or needing to try and get even, there’s a 19th hole designed by Patty Sheehan and three additional practice holes near the range. En route to Tahoke, the Genoa Lakes Course, designed by John Harbottle II and Peter Jacobsen, might be worth a visit. It’s a links stye design with lush wetlands and the bordering Carson River bringing water into play on 14 holes. Two miles away is the Ranch Course where Johnny Miller lent Harbottle some design help. The Edgewood Tahoe Golf Course, host of the annual American Century Championship that features celebrity golfers each summer, should probably be your first choice in Tahoe. Sitting right next to Lake Tahoe, it was originally designed by George Fazio and now includes some modifications by Tom Fazio. I recall that there’s one hole where the state lines of Nevada and California meet. The best value near the southern shoreline is the Lake Tahoe Golf Course, designed by William Bell. It flows through a meadow with scenic views of the Sierra Nevada mountains. Don’t overlook going up north to play some mountain golf at almost 5,000 feet above sea level at Incline Village’s Championship Course. Fairways bordered by towering pines put more emphasis on accuracy off the tee. Plenty of lateral water hazards add to the challenge. Looking for a quicker round, the par-58 Mountain Course here can be a fun challenge, providing you with incredible views of Lake Tahoe. The nearby Resort at Squaw Valley offers a links style design by Robert Trent Jones Jr., that winds through natural wetlands with a few holes farther up the mountain on the back nine. 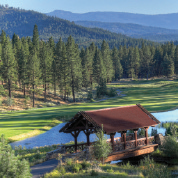 For perhaps the best golf for those looking for a private club feel, many go straight to the historic Truckee area across the state line in California, 15 minutes from Lake Tahoe and less than 45 minutes from Reno. My favorite is Coyote Moon, offering a tranquil mountain-style golfing experience on 250 secluded acres of rolling hills framed by towering Ponderosa pines without anything to spoil your views. The Brad Bell design meanders among granite bluffs and around and across crystal clear Trout Creek, including the par 3 13th (230 from the back tees) that features a 200-foot drop to a green tucked just across it. Towering Lodgepole and Jeffrey pine line the fairways at the Golf Club at Gray’s Crossing, designed by Peter Jacobsen and Jim Hardy. Its nearby sister course, the Jack Nicklaus-designed Old Greenwood winds through Jeffrey pines, along creeks, providing spectacular mountain views. Avoid the “Nicklaus tees” at 7,528 unless you are a scratch golfer who hits it long. The resort community has been recognized as an Audubon sanctuary. Members of the Tahoe Mountain Club, including lots of ski lovers, get preferred rates at both courses. 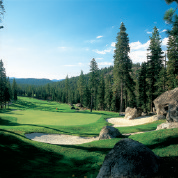 Schaffer’s Mill Golf Club, formerly called Timilick Lake Tahoe, features two distinct nines—the Meadows meanders through the base of a ridge before you climb to the Mountain, offering plenty of elevation changes. Schaffer’s Mill was designed by Miller and Harbottle. The Tahoe Donner Golf Course’s greens may be the best in the Tahoe area. It’s a true mountain course featuring stunning views, meandering creeks, granite rock formations and lots of elevation changes. There are four good golf options in the Graeagle area which is also worthy of a shorter visit of its own. For mountain golf in an unspoiled setting, the Bob Cupp-designed Grizzly Ranch is definitely one not to be missed, offering plenty of spectaclar mountain vistas. Property owners took over the course in 2012 and made many renovations to upgrade it. The Nakoma Golf Resort has taken steps to make its course, perched above the wild and scenic Feather River, more player friendly by widening some fairways, eliminating some bunkers and re-doing some greens. There is a Frank Lloyd Wright-designed clubhouse here plus a 42-room Lodge at Nakoma that was scheduled to open this summer. Whitehawk Ranch is a natural beauty, meandering through pines, cedars and aspens. The fairways are framed with native grasses, California poppies and Blue Lupine. The Homer Flint-designed Plumas Pines Golf Resort remains the best value. It’s short by today’s standards, but tight fairways bordered by tall pines put the premium on accuracy.